Make this kneeboard your own by embroidering your name. The Flyboys Kneeboard is our most popular pilot kneeboard designed for both VFR & IFR pilots. Make this your own by embroidering your name. Please add approximately 3 extra days of shipping for this custom work to be completed. Items that have been custom embroidered CANNOT BE RETURNED OR EXCHANGED unless we have made the mistake. We go solely off of the information that you provide, so please check for correctness. The Flyboys Pilot Kneeboard is probably the most versatile pilot kneeboard on the market. Designed by an F-16 pilot, this aviation kneeboard is narrower than typical tri-folds. It features seven eyelets for securing checklists, plastic checklist pages or an in-flight guide. Measures 8"x 5.5" x 1"
Clipboard itself measures 8"x 5"
Heavy duty plastic FlightCrew checklist pages that work with the Flyboys Kneeboard. 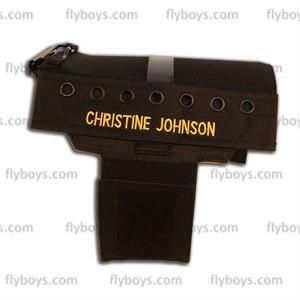 Opaque nylon locking checklist ring to hold your checklists and in-flight guides on Fly Boys Kneeboards (with eyelets).